Show your Valentine that your love has No Limits by indulging them with these decadent Chocolate Truffles on Valentines Day. 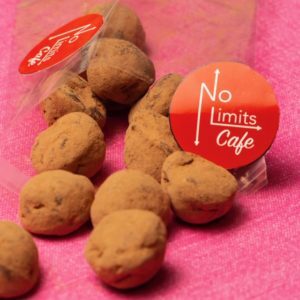 These truffles are made by OUR Valentines: potential employees of No Limits Cafe. This is our first “sneak peek” into the cooking abilities of the people who are at the heart of our organization.Made with Valrhona Bittersweet Chocolate, these truffles will be available in both Milk Chocolate and Dark Chocolate. The Valentine donation period begins today, and will run until February 7, 2019 at 12 noon. We are only making 1,200 of these delicious treats, so be sure to get your orders in soon! All donations will benefit No Limits Cafe, and can be made through PayPal via the button below.